A BOM designed for the Christmas Lover in us all. Those beautiful quilts inspire me to create my Baltimore style quilt. When I think of Christmas I think of the Thomas Nast drawing of Santa. He "invented" the image popularly recognized as Santa Claus today. 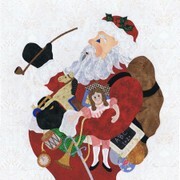 His Santa Claus was published for the 1862 Christmas season Harper's Weekly cover. stated by President Abe Lincoln. It was both of these elements that inspired me to make my Baltimore Christmas quilt. with holly and berry swag applique border. 70" x 70." FREE classes that will be run twice a month for this quilt. you can still attend for a fee of $10.00 per class. 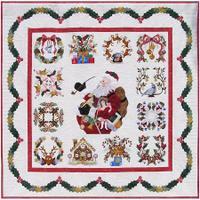 We want to have this quilt done for Christmas 2011. The classes are set up so you can enter at anytime and begin the basics and start where you want. only or hand applique. Basic hand applique techniques will be shared. is additional cost for the program when purchasing monthly. Monthly $85.00 1st month payment and $15.00 per monthly kit. It is here at the JaM Patch!!!!!!! 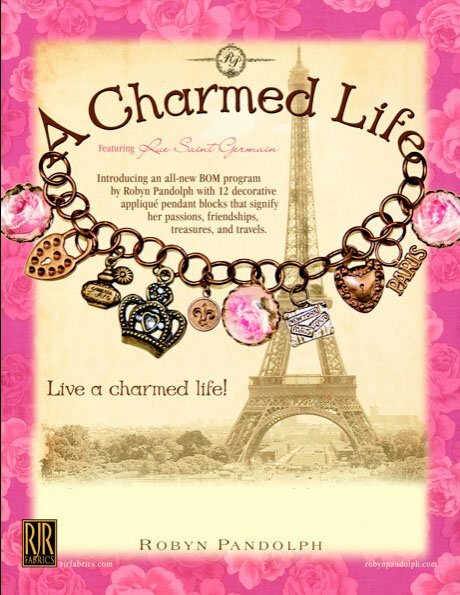 Please see information and sign-up sheet at the end of section on "A Charmed Life." special moments dangled from yout wrist. Here is a link to the fabric swatches at RJR Fabrics. The center is the Eiffle Tower!!!! What a charmed life to remember Paris!!!! And here it is! The picture doesn't do it justice. 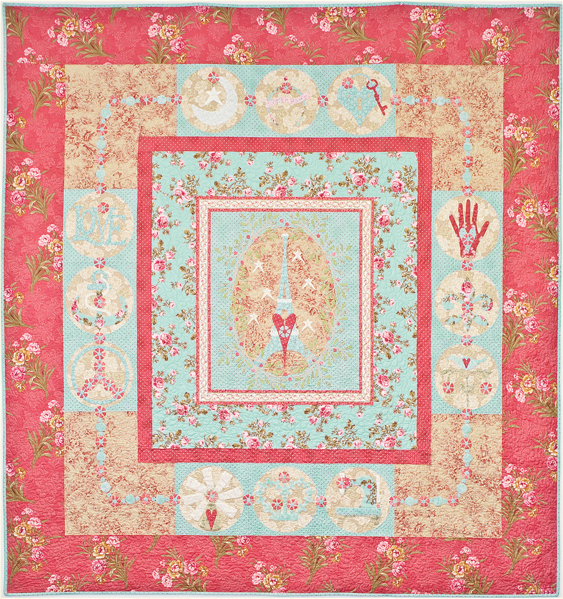 We have kitted this special Block of the Month Program to assist you in completion of this quilt top. The fabrics for each block have been individually cut and are in the corresponding pattern folder. We have reduced the amounts suggested if possible to keep the cost of the fabric kit to a minimum. The yardage of backgrounds is whole and to be cut as directed for the 12 blocks. Block 13 is cut separately. All the block background have been done “reverse appliqué” with the blue dot cut away from the floral fabric. This cut out section is then used throughout the appliqués. Save all your cut outs! Our sample has been completed with fusible appliqué. We used Steam a Seam Lite. When the pieces have been fused down they are then stitched down to assure they are there to stay. The stitching also enhances the designs. We chose to stitch the appliqués down before the blocks have been put together.